Spray-Away by Straight Arrow Products, Inc. is a safe, gentle, quick cleaning body wash that allows horse owners to work less and clean more. In 1970, our family company, Straight Arrow, introduced Mane 'n Tail Conditioner, a product that continues to be leading edge in terms of quality & effectiveness. This product was followed by Hoofmaker, Mineral Ice & Shampoo. Over the years we have been providing these high quality grooming & treatment products to the equine industry and continue to make all of our products with the same concern for quality and performance as we did when they were made on the family farm. While we don't make the products on the farm today, our goal remains the same, to introduce new items that will fill our customers' needs and meet that same performance challenge. New items added to the equine line include offerings in the medicated treatment and finishing areas. With the latest being the introduction of Spray-Away, the safe, quick body wash solution that horse owners can feel comfortable using as often as needed. 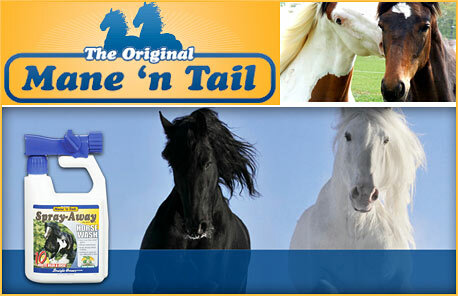 All additions to the line reflect the same high quality and leading edge performance of the Original Mane 'n Tail. I am particularly proud of my family's tradition "Satisfy the Customer". All of our products are designed to stand the test of that tradition. Straight Arrow remains a "hands on" business and I want to thank all of the horse owners who have supported us over the years. If for any reason you are not satisfied with the performance of any of our products, a refund will be provided. You have my guarantee on it. Finally, a one-step cleaning process that really does the job well! Spray-Away is a safe, gentle, quick cleaning body wash that allows horse owners to work less and clean more. Spray-Away's quick-cleaning, gentle body wash has long been a horse owner's dream. The problem with other formulas has been harsh results: dried out skin and coat, as well as a mane and tail left feeling like straw. Now the dream has finally come true! Spray-Away and other great Straight Arrow products are available JeffersEquine, ValleyVet, DoverSaddlery, SmartPak and at most feed and tack stores, but we are happy to get you to our dealers or to help you personally with questions via email or phone calls.